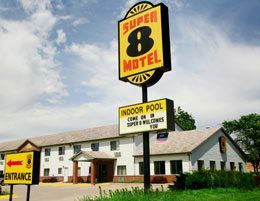 Super 8 Motel - Fairfield, Iowa - Tune into our Vibe! Fairfield's Super 8 Motel is located 1.5 miles west from the Fairfield Square, and provides a daily SuperStart Breakfast with seating in lobby near the Big Screen TV, free high speed internet and Wi-Fi in each guest room. Other amenities include an indoor heated pool and fitness center. The rooms feature one king bed or two queen beds and most rooms are non-smoking. Jacuzzi suites are available and pets are welcome.